Water is included in the state list (List 2) of 7th schedule of the Constitution of India except inter-state rivers and river valleys. All activities related to planning, development and management of water resources are undertaken by the respective states. All surface water management related activities in the State of Maharashtra are managed by Water Resources Department (WRD). The Water Resources Department (formerly known as Irrigation Department) has a glorious history of Irrigation and Water Management over last 150 years. The MWRD came into existence in 1867 as a separate organization under Public Works Department during British era. The state of Maharashtra came into existence in the year 1960 after bifurcation of old Bombay State into Maharashtra and Gujarat. In the year 1960 the Public Works Department was divided into Irrigation Department and Building and Communication Department. On 26 October 2004, Irrigation Department is renamed as ‘Water Resources Department’ resembling the importance of water as a scare resource. The Water Resources Department is entrusted with survey, investigation, design, construction, maintenance and management of water resources and hydropower projects in the river basins of the state. It also undertakes command area development programs, water drainage schemes, research activities, training, dam safety, quality control, hydrology data collection and analysis, Kharbhumi schemes etc. Till 2012, department constructed 3,332 water resources project and thereby created water storage capacity of 54,000 Mcum and irrigation potential of 48.61 lakh ha across state. 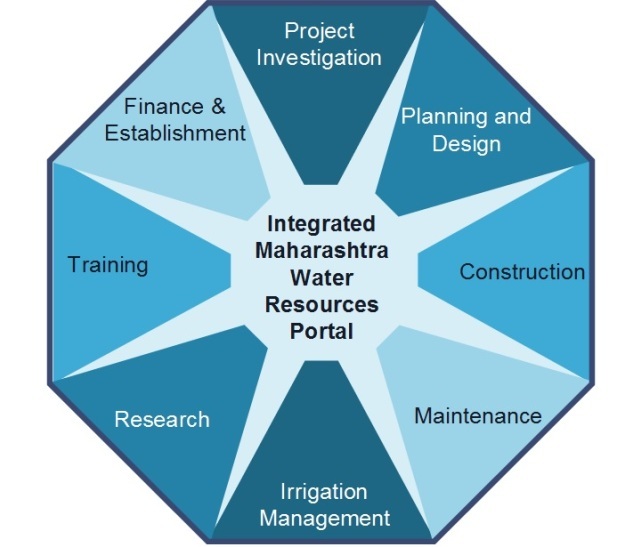 The Maharashtra Water Resources Department (MWRD) is managing precious resource for the state of Maharashtra and department has created huge infrastructural projects. MWRD is implementing innovative e-Governance project named as “e-Jalseva”. Earlier, project was started as component of MWSIP and named as Integrated Computerized Information System (ICIS). The 34 modules (refer annexure 1) from 8 functional area covering all major activities of the department will lead to less-paper working. e-Jalseva project will ensure integrated, real time, one point source of all water related information of state as a whole. Further using BI tools the optimum utilization of resources and informed decision making is also possible. The modules like Asset Management, Litigation Management, Parliamentary questions, training, accounts etc. are helpful for other departments as well. The capacity building initiatives through CIO course and special e-Governance course of IIM Indore are prominent initiatives carried out by MWRD. The department owns the project and dedicated officers are driving this project. The success of project implementation lies in top down and bottom up approach adopted for sensitizing the officers which is also unique in this project. The in-house data digitization initiatives and concept of eJalseva Month viz. “eJalseva Abhiyaan” was as effective, as it was innovative. The ‘panchsutri’ of awareness, training, data digitization, data validation and use of system were powerful parameters for driving the initiative. World Bank & Chief Secretary of Government of Maharashtra have appreciated efforts taken for this project and NISG has created case study on this project for CIO course as every aspect of this project is an innovative initiative. This project is a first initiative of its kind in the country and department has devised a vision plan including GIS maps, eMeasurement Book and canal automation using SCADA system for collecting data at source and automatic passing of same to the stakeholders. 2. Duplication & dis-integrated approach of data capturing leading to conflicting information at various forums. 3. Timely availability of Information at various levels. · Better WR management with real time data regarding availability & demand. · To enable WRD to deliver services, in more effective & client oriented manner. · To improve efficiency of Administration. · To exercise better financial and budgetary control. · To facilitate a collaborative working culture. · Capturing data where it is generated & dissemination of data electronically wherever & whenever required. · Better work flow management. The Clarity PPM product suite is the main stay COTS product used for developing the ICIS application with web based front end. It consists of forms, reports and work flow mechanism to present the MIS of any module. · For a smooth roll out and successful implementation of eJalseva, a dedicated Project Management Office (PMO) has been established at Pune under Superintending Engineer, Koyna Design Circle in July2012. PMO coordinates the activities of related vendor management and procurement management. · The PMO, comprising of about 9 officers having departmental domain knowledge and 3 technical experts from PMO partner NISG, aims to ensure sustained performance and improvements to the e-Jalseva application in the future. PMO provides technical advisory and hand holding support to the field officers during and after the roll out of the system. · An integral part of any eGovernance Project, Change Management (CM) has been an instrumental tool for driving the acceptance of the project among the WRD employees. Focusing primarily on Training and Communication strategies and their implementation, the PMO has carried out numerous awareness workshops and trainings to drive the project. To train the application, a Master Trainer (MT) / Trainer of Trainers (ToT) approach has been adopted. · As of now about 15000 plus man days of trainings have been imparted by the PMO. 800 plus Master Trainers have been trained so far. · Under Project Management activities, all 34 modules went live in a phased manner. Initially, a total of 42 pilot projects were entered in the system across six administrative divisions in Maharashtra. Network connectivity for the project is being provided by BSNL through VPN over broadband. Network connectivity at 645 locations is already completed by BSNL . User level hardware (Lot I) was delivered to all WRD offices and installation got completed at around 700 locations also training for the hardware, Linux operating system and Open Office is completed. · Till date around 3700 plus irrigation projects have been entered in the module M8 of the system which is the master data and provides inputs to all the other modules. For Non Irrigation (NI) assessment data, related to NI customers and Farmers, the Master data has also been entered in module M19 of the system and 6356 customers for Non Irrigation are created and validated. Also more than 10,03,190 farmers data on various projects is entered. Online submission of Monthly accounts from module M24 of the system to Accountant General, Nagpur through web service has already been achieved successfully since January 2014. This is being done by 137 divisions now being entered through the system only. · Around 150 GB data of textual data is present in the system. In addition another 50 GB of data in form of attachments has been input by the departmental. ICIS projects' procurement and training components' implementation are completed for by March 2014 as per above status. Post implementation completion all the infrastructure procured and applications developed will be under 3 years warranty. The customized e Jalseva application will also have additional 3 years post warranty support from the System Integrator. e-Jalseva is ambitious eGovernance initiative of Maharashtra Water Resources Department which was conceptualized as Management Information System and later on it was re-designed and implemented as comprehensive integrated e-governance project covering 726 offices of department. Employees, citizens, farmers, water user associations, industries, contractors, project affected persons, other government departments, media etc. are the major stakeholders of the department. Although e-Jalseva is designed so as to fulfill major requirements of these stakeholders, at this stage of implementation, biggest beneficiary of the system is its employees. Currently, e-Jalseva is at transaction stage where electronic delivery of some processes is achieved and road map is prepared and being implemented in a phased manner in order to progress to Transformation stage, where there will be joined-up services and all transactions will be carried out through system only. 1) Centralized unified Database: Earlier data was available at or near source. Whenever policy makers required some data, letter is sent to lower level office asking to submit data in prescribed format. When data is received, often it was observed that it was inconsistent and not matching with earlier record entries. Even some time data was not made available due to various reasons. E-Jalseva helped to create central database which updated by the owner of data and validated by superior officer and thus instantaneously data is made available for decision making. 2)Saving in Time, effort and cost: Approximately 15 days to 2 months were required to gather the data from field office to Mantralaya. E-Jalseva acts as speedy route for commination between various levels of authorities including vertical and horizontal data movement. 3)Record Management and Documentation: Huge amount of information is generated while constructing and managing water resources projects, which if not captured gets vanished. E-Jalseva provided platform for one-stop solution for all records and documentation. 4) Empowerment of Employee: The system helped many employees to be acquire knowledge about ICT and some of them become expert in computer and started solving problems faced by other employees. MWRD decided to digitize all its data through its employees only. It was crucial decision, but after proper training the idea worked successfully. This helped in getting in-depth understanding of system to the employee as well as cost is saved as outsourcing is avoided. 5) Infrastructure Development: Laptops, Desktops, printers, LAN, Network connectivity etc. is provided as a part of e-Jalseva empowered infrastructure facilities in the offices of MWRD. Some offices were remotely located were not connected with Broadband internet connection are now connected to world of internet. 6) Master Trainers: This concept was efficiently implemented for inculcating training to the employees. The human resource capacity of MWRD is approximately 50,000. It is not possible to train all employees in short span of 2 year. Therefor concept of Train the Trainer is adopted and selected officers were trained to acquire certain level of understanding of e-Jalseva and they conducted training session in their offices at filed level. They also acted as help desk for many employees. 7) Capacity Building: Till date about 15,000 plus man days training is provided within the department. Training, workshops, discussion forum etc were organized as and when required and on regular basis. Nearly 800 master trainer along with Change Management division of PMO office worked hard to empower employees of MWRD. As already mentioned, current version of e-Jalseva is focused on its employees (G2E) l. In coming time, it is planned to bring out next version of e-Jalseva catering the more to the needs of citizens, industries and contractors. Then impact assessment on these stakeholders will be studied. 4) Online estimate preparation functionality including DSR, rate analysis etc. 1) Development of HRM related module consistent with requirements of MWRD. 4) Appropriate mobile devices as per technological requirements. 4) Implementation of cutting-edge ICT-based improvements in the water sector.